Announcement My textiles are woven with care and the hope that they will become an heirloom for your home and hearth. My textiles are woven with care and the hope that they will become an heirloom for your home and hearth. Beautiful soft colors in a neutral background......It couldn't get any better than this. I am delighted in every way with this purchase. The towel itself is gorgeous. 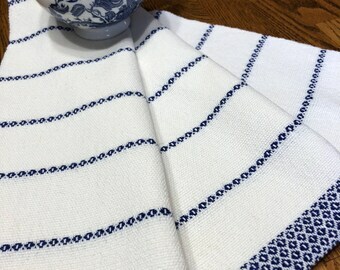 There's nothing like a beautiful hand woven towel to make drying dishes a pleasure. The towel was nicely wrapped and came with a beautiful little note card as a surprise gift. (I love surprises!) It doesn't get any better than this. Working on some neutral colors for spring. My weaving studio complete with a lovely fireplace. Rainbow block towels on the loom. Pepper, our lovely black and grey Standard Poodle. Jack, our three legged rescue Goldendoodle. Jack follows Pepper's lead and supervises all weaving in the studio. 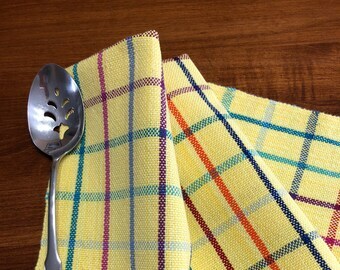 Bright and cheerful napkins being woven on one of my looms. Welcome to my weaving studio! My weaving studio can be a zen like place to work. Some days classical music softly plays in the background. On other days a quiet silence with only the sounds of birds or our Highland cows softly moving about outside my windows to disturb the peace. The gentle swish of the shuttle and the quiet thump of the loom's beater as each thread is bumped into place while I weave gives me a chance to reflect on the day and my thoughts. In the studio my work mates are Pepper a black Standard poodle and Jack our three-legged rescue Goldendoodle. Both dogs not only keep the carpet on the floor from flying into space they are also accomplished weaving supervisors with many years of experience under their collars. Standard Poodles and Goldendoodle dogs do not shed which is a plus for a weaver who works with fibers and yarns. My studio has two looms that are almost always warped with a project that is in the process of being woven. Many bookcases full of weaving books, yarn - lots of yarn, weaving shuttles and collections of various things that catch my fancy give me inspiration and materials to draw from. The driving need to create something with my own two hands has always guided me through the learning process of teaching myself to weave. Without access to formal weaving programs I am proud to say I am a self-taught weaver. Thistle Rose Weaving is my passion, my delight and a way for me to express and share my love for the traditional arts. Welcome to my weaving studio. I am an independent artisan weaver who works alone in my studio designing and weaving heirloom quality textiles one at a time on traditional floor looms.